This week, Gloria is challenging us to create a project involving tags. Challenge #11 Tag, You're It! Use a tag on your project. Create a handmade gift tag. Create a tag mini album. Add tags to your scrapbook layout or your card. You may use some hoarded tag-shaped packaging or you may cut tags from scrap paper using a die cut template. Maybe you hoard shipping tags of all sizes. As long as your project contains some sort of tag, you will meet the requirements to play along! 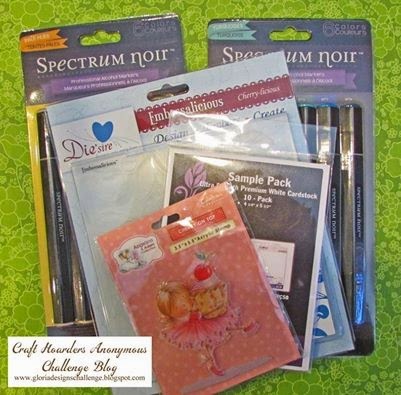 Our sponsor this month is Crafters Companion and Spectrum Noir. Crafter’s Companion US brings you the products to make crafting a little bit easier, including the Spectrum Noir coloring system, the Ultimate Pro, and more! Crafter’s Companion produces a full range of tools to create cards and other paper craft projects. Their mission is to make their innovative, award-winning tools accessible to crafters around the world at fantastic prices. Spectrum Noir is the revolutionary coloring system brought to you by Crafter's Companion. The range combines affordability with versatility across a vast color spectrum, deigned specifically for the crafting market. Spectrum Noir wishes to make both alcohol marker and pencil coloring achievable for colorists at all levels of confidence and ability. There is a great prize up for grabs this challenge so make sure to head over to the Craft Hoarders Anonymous blog to join in the fun. Here is the card I created as inspiration for this challenge. I used Spectrum Noir markers to color my seam binding ribbon and to color the edges of my butterflies. The tag is a digital tag from Etsy, the cardstock is Natural cardstock from My Favorite Things, and the patterned paper is from MME. I stamped the Blissful Butterflies stamp set by MFT in their Kraft dye ink. I fussy cut them out and popped the wings up with foam squares. Everything is edged in Tim Holtz Gathered Twigs Distress Ink. The flowers and butterflies were then dusted with Rock Candy Distress Glitter. Check out what all the other talented DT made for this challenge. This is just stunning, Amber! The beautiful colors of the paper contract perfectly with your glittered butterflies, and I love that the tag is at an angle. It's wonderful! This is really pretty, Amber. I love the soft colors and those fab butterflies! Amber, love your tag on the card! Your color choices are just beautiful. Beautiful card, Amber! I have never heard of the Rock Candy Distress Glitter but I am looking for it now! It looks gorgeous! This is just gorgeous, Amber!! Love, love, love the vintage feel and the butterflies that just came to life!! Gorgeous Card, love how you used the tag on it with all the fabulous details. Great idea coloring the ribbon. You rocked this challenge. You really made this tag work with it's card. I am reminded (ONCE AGAIN!) that Embellishments, like butterflies and roses, work just as well, if not better, when the color is the perfect compliment, and not necessarily the hues found in nature. Being literally-minded this is one of my greatest stumbling blocks. The glitter really makes your brown butterflies stars on this beautiful card. Thanks for taking the time to share. Gorgeous tag Amber! Lovin' all the butterflies fluttering about and the pretty blossoms!